What better way to get out of the monotonous routine that is daily life other than packing up a few things and start exploring the world? Traveling has become almost a necessity for some, a luxury for others, and almost impossible for a handful of people. Regardless, there’s no denying its importance when it comes to both psychological and spiritual health. Yet traveling can become quite stressful for most, even on marvelous and seemingly perfect days filled with sunshine and culminating temperatures. So what happens when it starts raining and your supposed relaxing break from the real world gets shattered? You get an umbrella, of course. An umbrella is indispensable in any given situation, despite your location or time of the year. Weather can become unpredictable, thus the only control you have over circumstance is being fully prepared. There is a lot of variety when it comes to a small, portable roof over your head during heavy storms or blistering sunlight. You can carry them in bags, purses, vests, jackets, and even pockets. Their compact shape is tailored for your comfort, safety, and gratification. 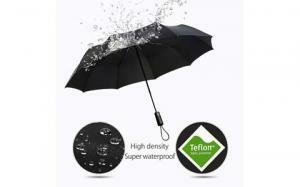 The Teflon coated windproof umbrella is a fine addition to any essentials pack. It is fiercely described as a product that defies Mother Nature herself. With instant drying features, resin-reinforced fiberglass ribs, automatic opening and closing, its 11.5” length and weight of 15 ounces, the Repel Travel Umbrella really knows what it takes to keep you perfectly dry. With a Lifetime Replacement Guarantee, you are promised a lifetime of dryness and protection from rain, snow and hail. If somehow this indestructible Super-Umbrella meets its Kryptonite, a replacement clone is sent immediately to continue its one and only role of keeping you secure. It is strikingly easy to carry, what with its ergonomic, rubber-coated handle, wrist strap, and even a protective travel sleeve. It has not 6, nor 8, but 9 resin-reinforced, flexible fiberglass ribs, which successfully withstand gusts of wind without turning inside out, completely backed up by its three-fold chrome plated metal shaft and strong metal frame. Its automatic, compact, and super light characteristics make this umbrella one of a kind, and most definitely a must-have in any ensemble. Still not what you’re looking for? No pressure, we got you covered. The next item might just reach your standards when it comes to a protective gadget. Okay, so maybe the title considerably gave away its basic assets. But alas, this first-rate parasol is coated with high-quality Teflon, dispersing water flawlessly, and is implicitly very easy to dry. Its fiberglass 10 piece stainless-steel rib fortification makes for an effective windproof feature, easily opposing nefarious wind blasts without bending the wrong way. The use of 210T micro-weave fabric makes the canopy resistant to 800 continuous openings and closings, therefore reinforcing its durable presence. The automatic and rapid open/close button makes for a valuable privilege when your hands are full, frantically rushing through town, rain gushing down on you. Mold and mildew have no chance against this abrasion resistant, stylish canopy. Easy to hold, the rubber grip handle is completed by an elastic looped wristlet, making this item slip-proof and effortless to carry. Backpacks, briefcases, purses, and even pockets, are eager to contain this mandatory element, facilitating your traveling plan anytime. Not to mention its exquisitely sleek waterproof leather case, which emphasizes any fashionista’s daily clothing style instead of weighing it down. It comes in black, weighs no more than 0.95 lb, and only has 12.6” in length. Lifetime guarantee is included, of course. The Benkii Windproof Umbrella is a fantastic asset when it comes to durability and efficiency. The 10 rib canopy is 100% windproof and UV resistant, with an opening of up to 42” and retraction of just 12” in length, giving this parasol both ample coverage and space-saving compression. The one second/one hand automatic opening and closing option makes for a remarkable distinction in which concerns proficiency, making it noticeably easy to use during heavy rains and strong wind gusts. Its resin-reinforced fiberglass ribs successfully fight against air currents, allowing thousands of bends without damaging its solid infrastructure. The premium quality canopy is water-resistant, made from high-density 210PG, giving it abrasion and mold immunity, bouncing off water like nothing else. The strong metal frame is complemented by a beautiful, compact and sleek design, the leather handle accommodating a comfortable grip, while the umbrella’s elegance turns this item into quite an accomplished gift for your loved ones. 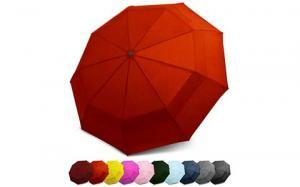 It comes with a replacement warranty and a lifetime guarantee, making this parasol worthy of its value. With a coverage diameter of 39” and only 11.5” closed length, the Umenice Umbrella offers you a compact and smart design, with a 210T thread-count fabric, certified by Charmous Dupont Teflon. It repels water, dust, and even oil. Effective in its fight against UV waves and windy storms, it is mandatory in any outdoor activity, having an automatic open/close button, easy to use in any kind of circumstance. Its 9-Ribs structural foundation is made from high-quality fiberglass and steel, providing flexibility and durability at the same time. Traveling made easy with excellent craftsmanship, its black steel tri-folded shaft being strengthened by 350 degree heat treatment, reinforcing rigidity and sturdiness. With a rubberized handle made from ABS, its grip caters to your comfort and safety, preventing any possible slip-ups or difficulty in managing the canopy. A buffer between you and whatever unpredictable weather has to offer, we recommend the Umenice umbrella with ease, complementing the slick look beautifully. The EEZ-Y Umbrella breaks conventional standards with its double canopy construction, allowing wind to pass through the vents, completely preventing it from flipping and breaking due to windstorms. Premium fiberglass and high-quality stainless steel make for a durable, flexible, and rust-resistant parasol, saving you the trouble of confronting a broken gadget’s fate. Strengthened black metal shaft and 9 fiberglass ribs guarantee remarkable windproof and waterproof qualities, maintaining your clothes dry, your life safe and your mood content. It is lightweight and enduring, with a 210T specially coated repellent material and a rubberized handlebar created for your comfort and delight. It folds back to 11” in an efficient one-handed operation with the help of a single button, making it easy to use in any condition, and also compact enough to fit in backpacks, purses, bags, and even pockets. Quick rain and UV protection at the negligible cost of pushing a single button. It comes in all colors and has a lifetime guarantee with a full refund offer if it doesn’t rise to your standards, including a lifetime replacement warranty. How are travel umbrellas different than regular ones? The main difference between travel umbrellas and regular ones is their quality and durability. Whenever you are in a rush and you need an umbrella to protect you from the rain, you probably buy the first model that you see, without really analyzing its features for too long. Usually, those are poor quality umbrellas that break when the first strong wind hits you. Travel umbrellas made by modern manufacturers are sturdy, made of high-quality, heavy-duty materials, come with UV protection, have a smart opening and closing system and are easy to carry with you, as they are foldable and compact. The beauty of owning a business umbrella, for instance, is its design and exactly the fact that it doesn’t fold. In the case of travel umbrellas, this is the only thing that they don’t offer. Although they can be stylish and classy, their design is meant to serve the needs of a traveler. Most of the times, this means that an umbrella needs to occupy as little space as possible and to resist regardless of the weather conditions. What are the best features of a travel umbrella? When thinking about the best travel umbrella’s features, there are very few things that come to mind if you don’t do a little research first. What everyone needs from this accessory is to have an opening system that is easy to use, a canopy that is durable and a stick that will not break after the first use. For some people, the colors, the design, the shape and the size might matter, too. What the best travel umbrellas offer aren’t features that one thinks would be important. For instance, some models come with an intelligently canopied construction with vents that allow wind to go through, but protect you from water under any circumstances. This means that it will resist when the weather is very windy and it will not be turned upside down, as it usually happens. Some manufacturers guarantee that your umbrella will not be flipping inside out by creating a special rib structure. UV protection is also important and appreciated by those who travel to warm destinations. 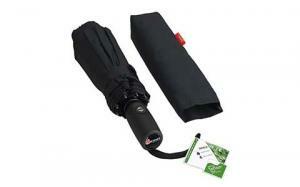 Portability is another important element that you should check off your list when shopping for a travel umbrella. The less space you save, the better. Is a travel umbrella more durable? There are a few important reasons why a travel umbrella is more durable than your average one. The materials that were using in the rib and canopy construction, the quality of the stick, the Teflon coating, UV protection and the weight of the model are all elements that make an umbrella more durable. By having all of these features, it is less likely to be damaged by the sun, wind or rain over time. Also, you won’t risk breaking it at the first shock, which will helps you remain calm and relaxed no matter the weather. After all, rain can be beautiful and, with the right umbrella, it can leave you with amazing memories from your travels. Hopefully, you are now fully informed regarding this mandatory item that cannot under any circumstance be missing from your household, having a guiding inventory to help you choose the right one. You cannot stress a parasol’s necessity enough, hence this respectable list of items is eagerly ready to inform and delight you with its content whenever you feel unprepared and indecisive regarding your personal protective gadget. Traveling becomes much more relaxing when you know how to thoroughly prepare yourself for any situation. Make it easier on yourself to enjoy your free time.